TheArmenianKitchen.com : One Plant - Two Incredible Flavors! What do coriander and cilantro have in common? They come from the same plant. What’s different about coriander and cilantro? Their flavors. They are very different, and definitely not interchangeable. Coriander and cilantro are used in numerous cuisines: Mediterranean, Middle Eastern, Indian, S. and SE Asian, Chinese, African, Latin American, and Mexican. Coriander is the dried seed of the plant. It is sold as whole dried seeds or ground. To draw out the nutty flavor of the seeds, heat them in a dry skillet before grinding. Seeds should be stored in a tightly covered container away from heat and sunlight. 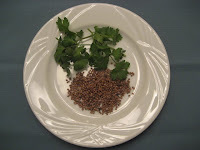 Ground coriander tends to lose its flavor quickly, so grinding just before using is preferred. Coriander is used to season meats (as in marinades or rubs), stews, sausages, pickling, and even in brewing certain types of beer. Sometimes called Chinese parsley, cilantro is used in salsa, salads, soups, dips, spreads, stews. To many, the leaf is an acquired taste. It has a citrus-sage-like quality, and the leaves a bit waxy. I am, however, addicted to it! I never thought about why I liked tomato salsa so much until I examined the ingredients and I realized it was the cilantro that attracted me. Cilantro is sold fresh, in bunches, often with the roots still attached. It should be stored in the refrigerator, in a glass of water, with a plastic covering over the glass. Change the water every two days. Snip the leaves, as needed, then re-cover the glass with plastic. When left wet for too long, the leaves will get slimy. Cilantro will keep for up to five days. Here's a recipe using fresh cilantro. If you've never tasted it before, give it a try. You might find it as alluring as I do. 1. Wash and roughly chop cilantro leaves. 2. Blend together the chopped cilantro, tahini, yogurt, and sour cream in a food processor or blender. 3. While the machine is running, slowly add the olive oil. 4. Place the sauce in a serving dish. Season with salt and pepper to taste. Use as a dip for assorted sliced vegetables, or as a sauce to serve with kebabs.